This is the next instalment is my ever increasing collection of books related to the Cthulhu Mythos. You can expect to see a few more of these appearing in the not too distant future, both because I have to write reviews and because I am really loving them… with good reason! 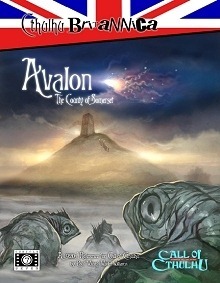 Avalon: The County of Somerset is a supplement, part of their ever increasing Cthulhu Britannica, for the Call of Cthulhu game, published by Cubicle 7 and written by Paul “Wiggy” Wade-Williams. The book is a colour softback, with B&W interior and 128 pages of goodness. At about £17 ($24.99) that is pretty good value for money. The paper is high quality, the bind is perfect and tremendous quality. After reading the book from cover to cover and carrying it in my rucksack for over a week, there are no signs of crises, no torn or detached pages and even the corners are in good knick. Although I am weary of B&W interiors, the designers at Cubicle 7 have proven once more why they are so successful at what they do. This is not a book that has been designed to be printed at full colour and then reduced to monochrome due to budget constrains. This book was designed to be printed as it is since the very beginning and the difference is huge. The cover illustration is atmospheric, simple and gorgeous, with a composition that fits the size of the cover perfectly. Once again, paying attention to detail has rendered excellent results. The interior illustration are perfectly adequate. No ground breaking art, but the conversion to B&W has been handled in such manner that all the detail is there to be enjoyed. With a great mix of line art, painting, cartography and photography, every aspect of the location is very well depicted. Also there are plenty of images to keep your eyes amused, so you’ll never be more than two or three pages away from a visual reference. The book is divided in various parts, starting with the history of the county from prehistory to the 1920’s. Geography, locales and legends and customs make the first half of the book, which, by the way, is extremely easy to read. the second 1.2 of the book consists of three adventures, a section with adventure seeds and an appendix. As mentioned the book reads very easily. The two column design makes for big enough type and the font is very pleasing on the eye. There is plenty of padding between columns, inserts and illustrations, and the text is very well paragraphed and formated. Talking about the inserts, they are white text on black background; you really can’t miss them, and that is a very good thing! There is a reason why I mention all this little detail with the design of the book. Good book design often separate the boys from the men. Or the professional publishers from the ones who don’t think enough before sending something to the printer. Cubicle 7 shows once again they’re professionals. It is pretty obvious they wanted to have a better looking product, but it is just as obvious that they have done a jolly good job out of the resources they had. Yes, it could be improved, but I’ll get to that later. The writer does a very good job. Even someone with dyslexia (that’d be me…) can follow through and understand everything perfectly. Rarely had to read something more than once and I had no trouble finding the same information again if I got interrupted. That, by the way, is the hell of a compliment. The style is to the point, clear and very entertaining. Wade-Williams expertise shows clearly, although, unfortunately, it doesn’t shine. Now, as usual, things I didn’t like…. not much. I like pretty much everything about this book. However there are things that could have been improved. The book has been written featuring the fictitious work of Professor Noah Ainley-Chant, who throughout the book, warns in various inserts and quotations of the perils and dangers, and about the hidden meanings of everyday life items, locations and legends. However more often than not, he comes across with explanations so farfetched that even for a fantasy setting they’re difficult to accept. Mostly this is because of the style of the writing, though. There is a difference between loosing your sanity for finding out the truth, and just loosing your sanity. The good old professor just sounds like he’s lost his sanity. He also sounds like the type of people you see in some street corners with a loudspeaker claiming the world is coming to an end because corporations are stealing our souls… Unfortunately, he lacks credibility as a character. A very good use of the Deep Ones is made by this book, though. They feature extensively and every time there is a perfectly reasonable explanation for it. Their relationship to the history of the land is made very clear and leaves us with no doubt of why they where there and where they are now. That was one of the high points of the book for me. The design lacks a little bit of atmosphere. I would have loved to see more design thrown into it. For example letters looking like letters, with torn paper, watermarked and hand written calligraphy, and not just like rectangles with letters in them. A little bit of art direction thrown into the pages would have worked wonders and make the book even more interesting to read. Now, a very clear message to Cubicle 7: WRITE ANOTHER ONE! This book is nowhere near being enough and I want more of the same! Seriously. The book leaves you wanting more and more. It merely delves into what could be a huge source book. It touches some very important (probably the most) aspects of Somerset and leaves the reader knowing there could be more to come. And it is wonderful to feel like that. I couldn’t help but feeling that this book could have been at least twice the size and still leave me wanting more, though, so maybe it’s just me. The adventures are also really excellent. Not too long, not too short and a bit for everyone. From bloody murders to creepy nightmares, there is something for everyone. Conclusion: buy this book…. now! If you are a Cthulhu games fan, the amount of information here will be abundant without being overwhelming. 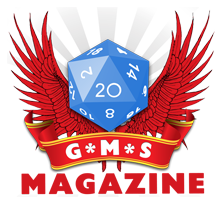 Both the adventure seeds and the adventures themselves are flexible enough they can be placed in any campaign and, at the very least, reading it will keep you amused for quite a few days.